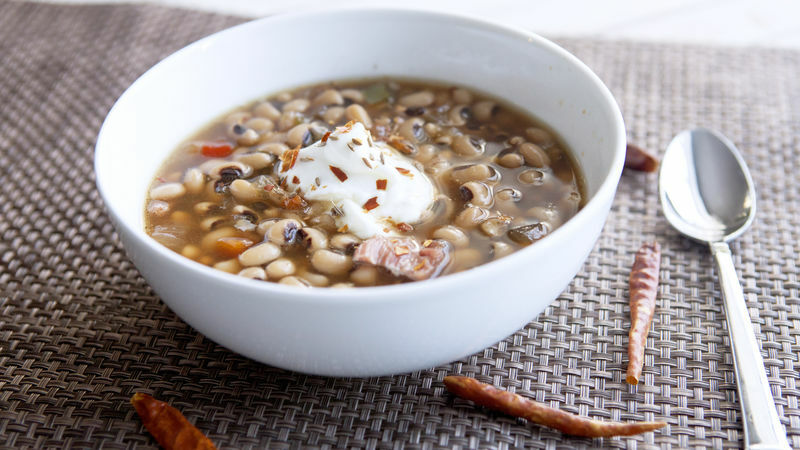 Did you know that black-eyed peas are good luck when eaten at the New Year? Now you do, and here's how to make them super easy! My mom still calls me every single New Years to make sure I eat some black-eyed peas. She is a firm believer that it brings good luck, and who am I to disagree? After eating them for 30 years, I get a bit bored with the standard version though, so this recipe is much more up my alley. It’s so spicy that it needs some Greek yogurt to take the heat off! These are easy to cook. You don’t need to soak them or anything, but you should sort them to make sure you get out any small pebbles. Also, give the dried legumes a quick rinse under cold water. Besides the peas, you just need a few simple veggies to finish out the soup. I like to add in a few smoked ham hocks which give the dish a really savory flavor. They don’t add a ton of meat to the dish, but the flavor is impossible to beat. Try to dice your veggies evenly and just add everything to a slow cooker! It just gets easier from here on out. To spice up the dish, I like to add a jalapeno to the veggie mix and also some cayenne pepper and a few dried arbol peppers to the mix. If you don’t have any dried peppers, you could up the cayenne pepper to 1/2 teaspoon, but I wouldn’t go more than that! Now you just toss everything in a slow cooker. Then add a quart of Progresso chicken stock and 2-3 cups of water. If you want the black-eyed peas to be dry, almost like a side dish, go with 2 cups. Personally, I like it a bit more soupy so I add an extra cup of water. Stick a lid on the slow cooker and cook it on low for at least 6 hours. Go to work. Sit on the couch. Do anything but think about this dish. After six hours come back, remove the ham hocks, and shred off any meat that you find. There won’t be a bunch of meat on it, but it adds some good flavor. Stir that back into the slow cooker and taste the soup for seasonings. You might need a pinch of salt, but probably not. This is spicy stuff so I really recommend a dollop of Greek yogurt or sour cream to the bowl. Here’s to good luck in the new year! Nick wishes he could’ve been out all day while this cooked because it smelled so good! Check out his blog Macheesmo, and follow him on his Tablespoon Profile.